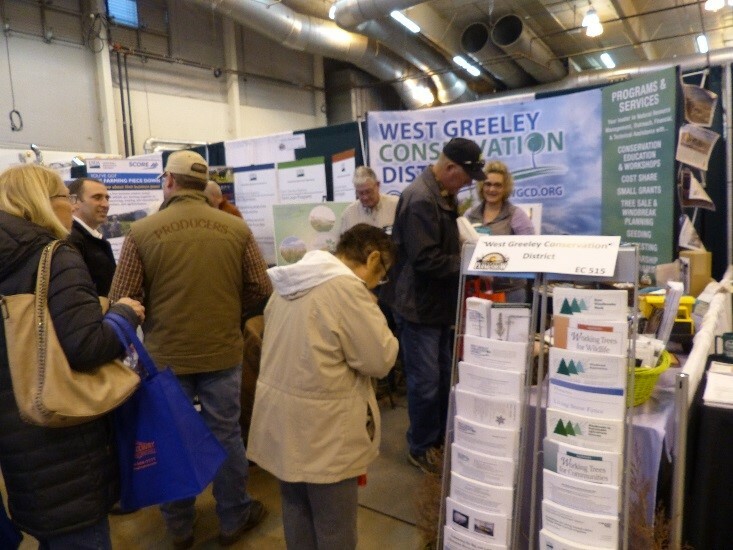 West Greeley Conservation District (WGCD) Board and staff hosted a booth located between NRCS and FSA’s booths in the Event Center at the 54th Annual Colorado Farm Show, January 23rd – 25th at Island Grove Regional Park. This year’s theme: IMPROVING LIVES BY SEEDS WE PLANT. Over 280 businesses and organizations provided Ag related exhibits filling four buildings and much of the open lawn space in the park. The Free seminars and speakers were interesting and informative and we felt like we welcomed and greeted at least half of the 30,000+ attendees. Participation in the Farm Show gives WGCD a great opportunity to support our Ag producers, many we rarely get to see in the office. 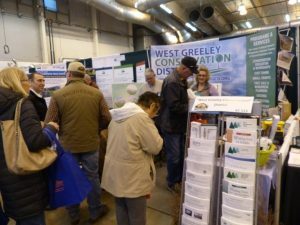 It also helps us make community members aware of the many services we provide from our cost share program and tree sale to our college scholarships and upcoming Northeastern Colorado Progressive Ag Symposium on March 14th and 15th. Click here http://www.wgcd.org/northeasternagsymposium/ to learn more about speakers and programs focused on soil and water that local farmers and ranchers can benefit from. We would like to thank the 2018 Colorado Farm Show Board of Directors and Committee Members for the many hours of energy, service and hard work they put into this highly successful event. We know there are about 100 volunteers who also made this happen. Thanks also to YOU, all our West District stakeholders, who stopped by and said hello, picked up information and asked our team questions. It was a productive three days. Do you know how the Farm Show got started? Here’s a bit of interesting history. A group of Colorado State University Extension Agents were having coffee back in 1964 when they agreed to organize, plan and facilitate the show if the Chamber of Commerce would assist and the ag industry would support it financially. That first year the show drew 30 exhibitors and was hosted it at the Greeley Community Building on February 16th & 17th – it was called the Colorado Agricultural Chemical Exposition. It was renamed the Colorado Farm Show in 1967. A Farm Show Chairman was appointed in 1968, a committee was organized and subcommittees formed. The remarkable thing is that from the beginning this event, then and now, is accomplished by dedicated volunteers. Check out the full history on the www.coloradofarmshow.com web site. 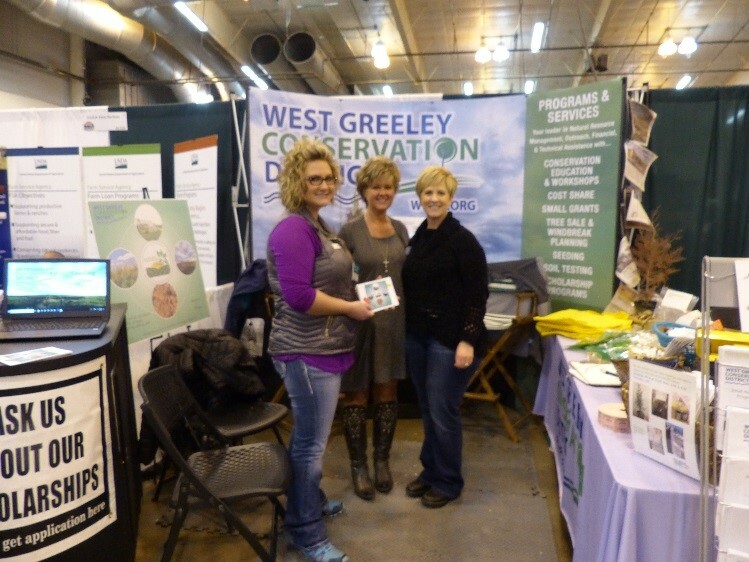 To find out more about the West Greeley Conservation District, call (970) 356-8097 x3.